Hello everyone I hope you all had a great Thanksgiving, ours was busy but it was a fun time for all. I am slowly getting things ready for Christmas and I thought I would give you a sneak peek at some stockings I purchased on Etsy for a fantastic price. They are made of burlap and are beautiful and I thought I would fill them with greenery to add some more warmth. 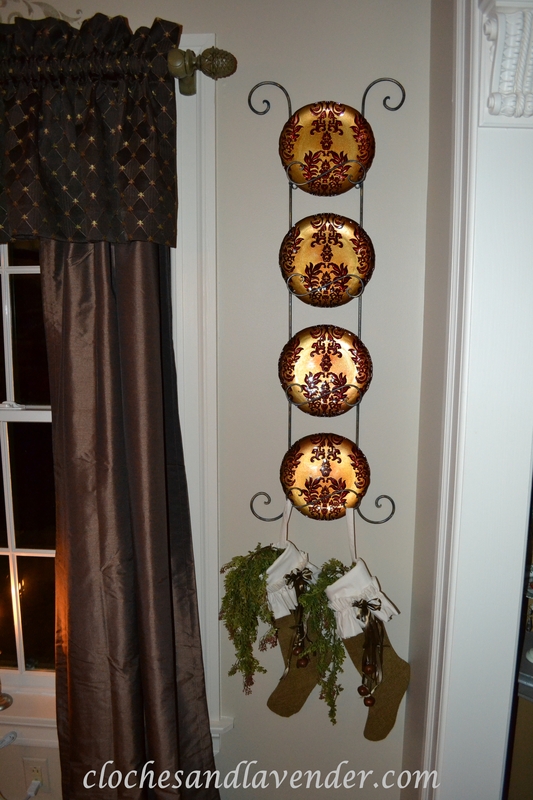 I added them to the bottom of the dining room plate rack to add some Holiday warmth to that side of the room. The plates I purchased a while ago at Home Goods. Some of you may remember them from a post a few months back. They’re so festive I thought they would be a nice addition to our plate rack along with the stockings for Christmas. I have a long way to go, but I hope to have everything put out along with our trees and such by the weekend. Love the stockings on the plate rack! The added greenery is perfect! Thank you so much, Shenita. These are so wonderful! I love the burlap and greenery! And the plates are perfect for the holiday season!! Cute stockings! I like your drapes, too! I agree, the plates are very festive..perfect for display this time of year. Your stockings are beautiful! I love that you hung them from the plate rack…very creative. Love those stockings filled with greenery! Adorable stockings! I love how you filled them, Cynthia. So very pretty. 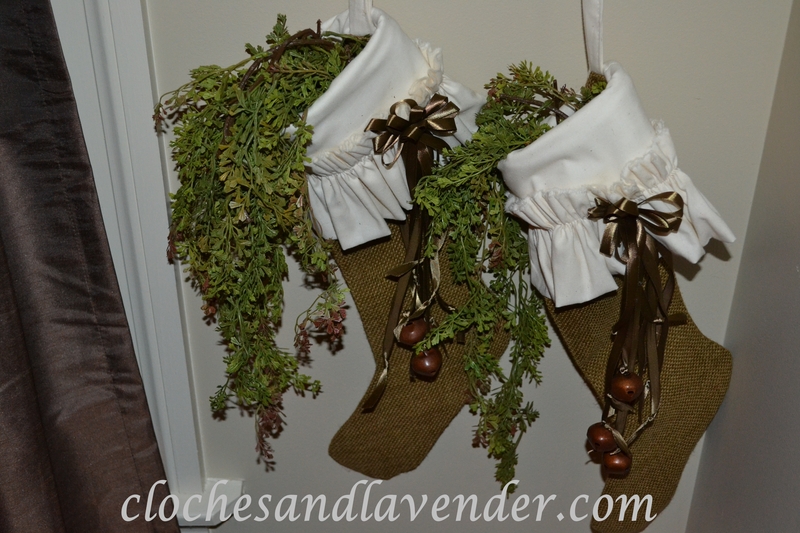 Your stockings are so adorable with ruffled trim and greenery! A wonderful addition to your gorgeous plate rack. I hope you had a wonderful Thanksgiving. Enjoy putting out your decorations and trimming the tree. Can’t wait to see everything. I just love doing the decorating with my music playing in the background, I am sort of a geek when it comes to Christmastime. Thank you for stopping by, I hope you will follow Cloches and Lavender. I just adore those stockings!! Love the greenery spilling out the tops too. Those stockings are so cute, Regina! I love the ruffle on the top! The little greenery is the perfect addition! Have a wondeful and blessed day! Thank you very much for stopping by, I love the stocking. Love what you did 🙂 I think we had better get busy!! lol! I have been starting to decorate away here. Thanks so much. The stockings are awesome – seems like a consensus amongst all your readers!! I couldn’t agree more! Thank you so much Stacy. The stockings are adorable and I love the cute ruffle. Thank you very much, I think they are great too. Thank you so much, I love when you pay a visit. I hope you had a great Thanksgiving. Oooh, Cynthia, I love those stockings! If I wasn’t so attached to the ones I made for us many years ago, I’d get new ones. Just like this, too! Thank you so much and thank you for your kind words. Cute stockings! Love the burlap with some greenery! Those plates are so pretty! I absolutely love those Christmas stockings! Gorgeous. And thanks for inviting me to stop by. Thank you for stopping by!!! I hope you will follow Cloches and Lavender. The entire wall looks great! You have arranged everything perfectly! It’s nice how the burlap is contrasted with a bit of a ruffle detail. Also, I really must get some greens! What a beautiful holiday vignette! The contrast between the plates and burlap is perfect. Thank you so much for visitng and your lovely comment. Your stockings are really gorgeous! Love them! Thank you so much I love the ruffle and the details. LOVE these! I actually purchased some burlap to make my own this year! Cynthia, your stockings are really cute and I love the plates! Thanks for sharing with us at my HOME and have a beautiful day. Thank you so much, I really like the way this turned out. Thanks for hosting. LOL, I did giggle whn I read your post this morning. Cynthia, the stockings are darling. I love the muslin ruffle and the addition of greenery is really pretty. They really make a statement added to the bottom of your plate rack. Thanks for sharing with Share Your Cup. Thank you Jann, I love the stockings too. Your stockings are just beautiful! !